New Delhi: ‘Plastics have to be used responsibly and judiciously and have to be recycled properly after use’, the Vice President of India Shri M. Venkaiah Naidu has said, in Chennai today. He was addressing the gathering at the Golden Jubilee Celebrations of the Central Institute of Plastics Engineering & Technology (CIPET), an organization devoted to development of plastics and allied industries. The Vice President said that on one hand there is a quest for improving the quality of life through better material comforts and on the other hand, indiscriminate use of plastics threatens to seriously erode the sources of our sustenance. ‘There has to be a proper appreciation of the appropriate use of different plastics’, he said. Shri Naidu raised some serious concerns about the threats to the environment which the durability and longevity of plastic products posed. Lamenting that convenience items that are intended for single use are being continually discarded to the landfills; littering our landscapes, he unequivocally stated that plastics are to be used responsibly and recycled properly. 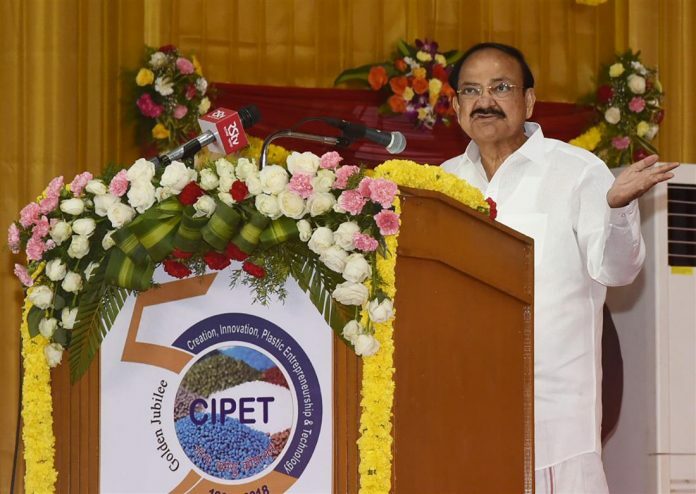 The Vice President congratulated CIPET and lauded the institution for training thousands of machinery operators, technicians and polymer engineers over the course of 50 years. 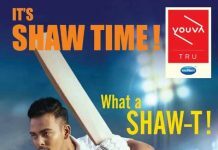 He also expressed his appreciation for the skill development programmes held by the institute during the last five years which benefitted more than two lakh unemployed youth. Shri Naidu said that plastic-based products have become an integral and important part of the global economy today due to their low weight, durability and versatility. Highlighting the utility of plastics in several crucial areas, from aeronautics to medical science to construction to 3-D printing, he opined that plastics have transformed everyday life. He urged CIPET to constantly upgrade and update its facilities with latest technological developments in the field of Polymer Science & Technology for the benefit of Indian polymer industries to compete globally, thus acting as a bridge to fill the technological gap between the Indian and global polymer industries. He also encouraged CIPET to focus more on developing indigenous technologies and innovations on products in order to facilitate export growth. Expressing his concern for the environment, the Vice President emphasized upon the need to adopt better waste management technologies, involving a circular economy approach, where used plastic becomes a feedstock rather than a waste. He asked CIPET to focus on developing technologies to replace conventional plastics with biodegradable polymers. He expressed happiness that CIPET has been collaborating with a number of institutions like the Medical Universities to produce prototypes of disposables and medical equipment. ‘These collaborations need to be taken forward if we have to promote Indian manufacturing and make healthcare more affordable in our country’, he added. The Vice President also advised CIPET to take necessary initiatives in creating awareness and educating people on the need to recycle, repurpose and reuse plastic items and to make sustainability the guiding principle in all their endeavours. 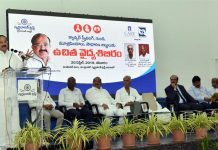 Recommending the Mantra of ‘Reduce, Reuse and Recycle’ for minimising the deleterious impact of plastics on environment, Shri Naidu warned that there is every need to ensure that plastics don’t finally end up in oceans. ‘There is no other alternative if we have to handover a safer planet to posterity’, he added. The Governor of Tamil Nadu, Shri Banwarilal Purohit, the Union Minister for Statistics & Programme Implementation and Chemicals & Fertilizers, Shri D.V. Sadananda Gowda, the Minister for Fisheries and Personnel and Administrative Reforms, Tamil Nadu, Shri D Jayakumar, the Member of Parliament, Shri J. Jayavardhan and others were present on the occasion. “It is indeed a great pleasure and privilege to be a part of this historic occasion of the Golden Jubilee Celebration of one of the premiere national institutions. “Central Institute of Plastics Engineering & Technology (CIPET)” – an organization devoted to development of Plastics and allied industries. I would first like to congratulate the governing body, the Director General, employees and students of CIPET on this momentous occasion. No doubt, the plastic industry clearly plays a vital role in the growth of Indian economy. The average consumption of plastics is roughly 13 kilograms per capita per year. I am told the current trend in India’s plastic exports seems highly encouraging and that plastics exports will be much above USD 8 billion in 2018-19, a 6 per cent increase from USD 7.56 billion in 2017-18. The country’s plastics industry also offers immense potential in terms of capacity, infrastructure and skilled manpower. India is currently ranked among the top five consumers of polymers in the world and has 30,000 plus plastic processing units employing over four million people across the country. Reduce, reuse and recycle should be the mantra for minimising the deleterious impact of plastics on environment. While harnessing the benefits of plastics, there is every need to ensure that they finally don’t end up in oceans. There is no other alternative if we have to handover a safer, cleaner and a healthier planet to posterity. Economics is fine, but what about environment? This should be the uppermost thought in the minds of those dealing with plastics.